There are many reasons to join the Marana Chamber of Commerce, but most of all it is our members and their involvement with all the events that make this Chamber so special. The Monthly Networking Breakfast event is the perfect way to start your day! Join the Chamber for coffee, breakfast, and networking. This well attended meeting is held at Colt’s Taste of Texas and begins with a very active networking reception at 6:45 AM, followed by a buffet breakfast. The networking breakfast is usually the 1st Wednesday of every month, with an exception to certain holiday schedules. Ribbon cuttings are a great way for members to introduce their business to Marana Chamber Members. Every business that joins the Chamber is entitled to host a ribbon cutting promoting thier place of business. Even home based businesses can partner with an establishment to host their ribbon cutting event. Held on the fourth Wednesday of every month at Northwest Fire Training Center. This event provides participants the opportunity to learn more about current issues and projects shaping the future of Marana. Make great business contacts at this relaxed after-hours event. Join your Chamber friends and colleagues, meet people and make new contacts! Join the most popular evening networking event in Southern Arizona! Held on the fourth Tuesday of each month. Cost to attend is FREE! In addition to the spectacular monthly events, The Marana Chamber also features quarterly and annual functions. 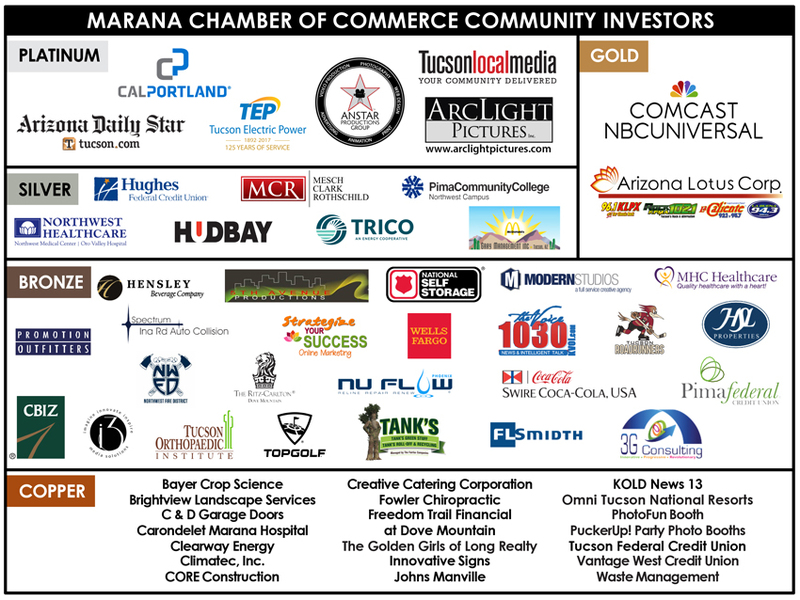 The Marana Chamber of Commerce is a resource for our business members and our community. Quarterly Luncheons are great community driven events that enable members to become involved with local businesses that are having an impact on our community. Co-hosted by our member The Highlands at Dove Mountain, these luncheons are also a great opportunity for members and guests to network. The Marana Chamber of Commerce also hosts the Annual Member Appreciation Luncheon where year end acknowlegements are made about our Member accomplishments and the targeted goals of the Chamber. The Marana Earth Festival is presented by the Marana Chamber of Commerce Green Committee. This annual festival promotes education, fun and sustainability. This year the event will be held at The Tucson Premium Outlets in Marana on November 4, 2017 from 12 noon to 5pm. The Town of Marana and The Marana Chamber of Commerce hold the annual State of the Town luncheon. Last April the Town of Marana celebrated it's 40th Anniversary where hundreds of supporters showed up to this luncheon co-hosted by the Ritz-Carlton Dove Mountain. Every year the Marana Chamber of Commerce hosts a Golf Tournament. Members enjoy this "Best Ball" tournament and there are plenty of sponsorship opportunities for businesses. The Marana Chamber continues to act as the voice of business for our members and the community. There are many merchant fairs that The Chamber participates in annually and shares a wealth of information to our members. The Procurement Fairs, SAHBA Home Show, Multi-Chamber Events, and the Chamber's very own Marana Earth Festival are prime examples of the Chamber's involvement with the community. 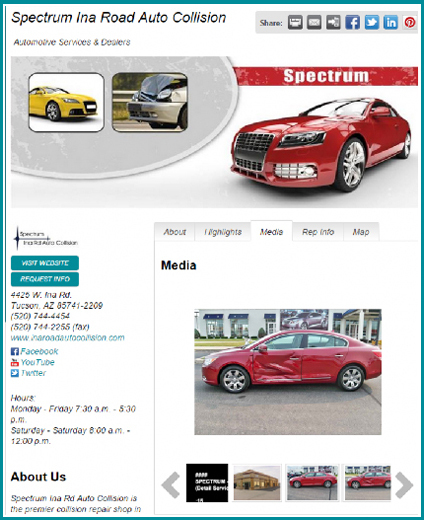 The Enhanced Landing Page allows you to build brand awareness & grow your digital presence. ● Your business will be assigned your own Strategic Marketing Partner to build your page and optimize your visibility. 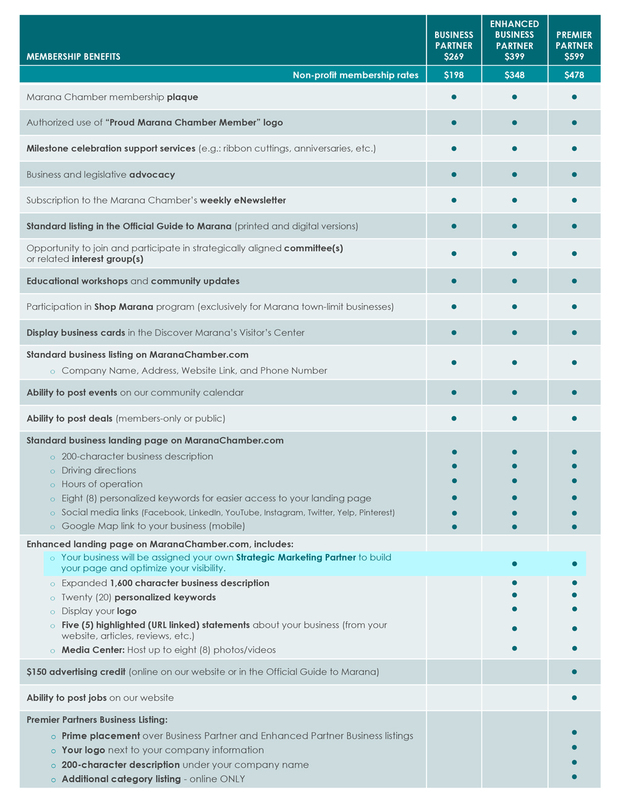 ● Select either the Business Partner, Enhanced Business Partner or the Premium Partner membership package. 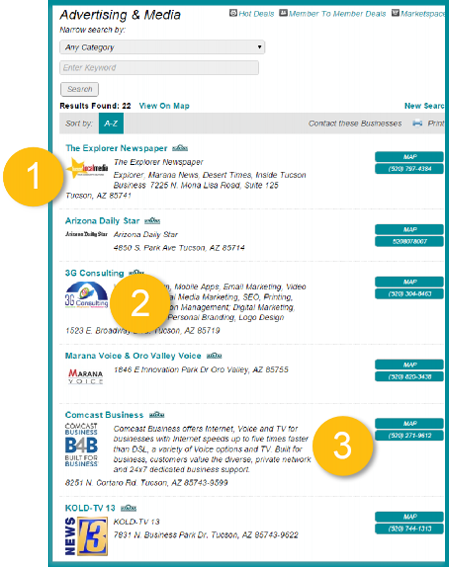 • Ability to have multiple location landing pages. 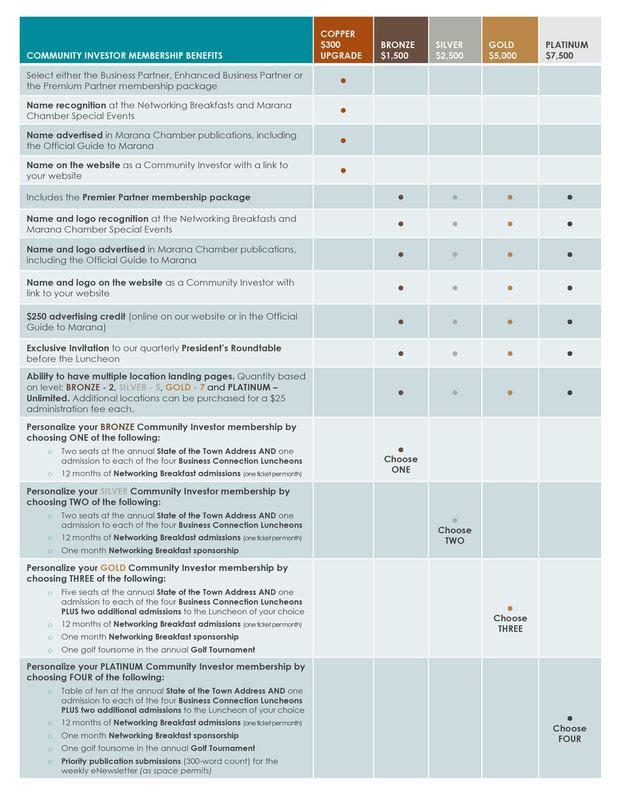 Quantity based on level: BRONZE - 2, SILVER - 5, GOLD - 7 and PLATINUM – Unlimited. Additional locations can be purchased for a $25 administration fee each.